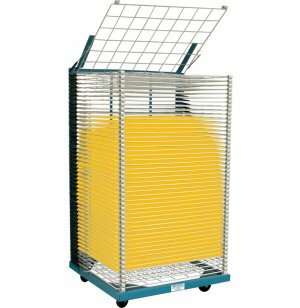 Heavy-Duty Drying Rack - 50 Shelves 42"x55"
Without a special drying rack, art projects can literally take over a classroom and leave you with no space while work dries. Depending on how many sheets have to dry at once, these drying racks let you dry projects from an entire class while taking up minimal space. 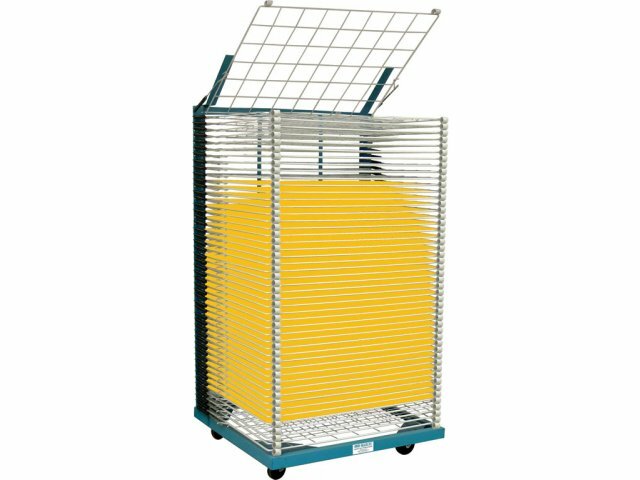 When you have a large quantity of oversized items that need evaporator drying while occupying minimum space, then take a look at this example of the "Rack-It" heavy-duty drying racks. Built on a welded steel frame, these racks provide a safe and sturdy resting place for a large number of projects as they dry on 50 shelves. Longer lasting than rubber, steel bumpers come standard on all heavy-duty racks. They are welded on the exterior of the shelf so as not to compromise drying room. Powder-coated, rust and solvent-resistant finish. 5" x 5" mesh openings. Space-saving Organization: A large stack of projects can be organized vertically while they dry, taking up only a minimum amount of valuable space in your art studio or classroom. Quick Drying: Art projects dry in no time, with wire-reinforced shelving that is spaced 1" apart to encourage efficient evaporation drying. Sturdy Construction: Racks are built with an all-steel construction, rust-proof and non-warping, for stable use and ultimate durability. Versatile: With a wide variety of models, we have a drying rack to suit your requirements. We offer portable racks, tabletop racks, wall/door racks, heavy-duty racks and lightweight racks, with a selection ranging from 25 to 100 shelves.